Martian Risk: some for short periods when cruise liners call. 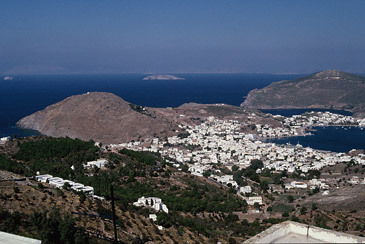 It is perhaps a pity that the fame of Patmos depends so heavily on the fame of the Monastery of St John the Divine, when the rest of the island can itself be such a ...well... Revelation. 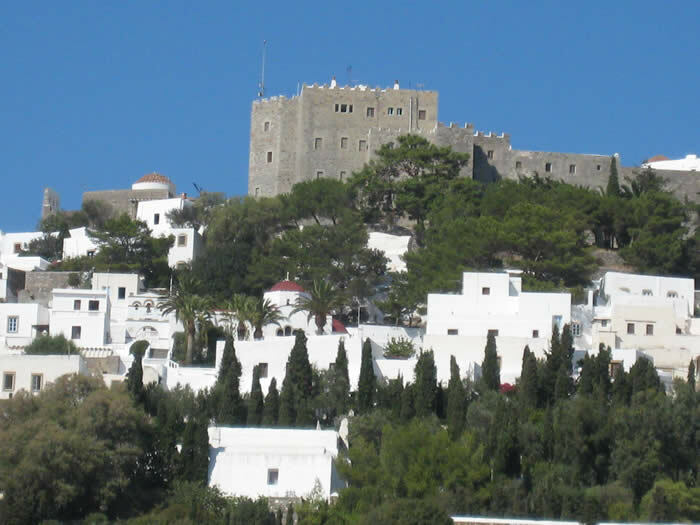 Apart from the busy quayside and the short road up to the Monastery, the rest of the island is unspoilt, green and hilly with dramatic views from the spine. 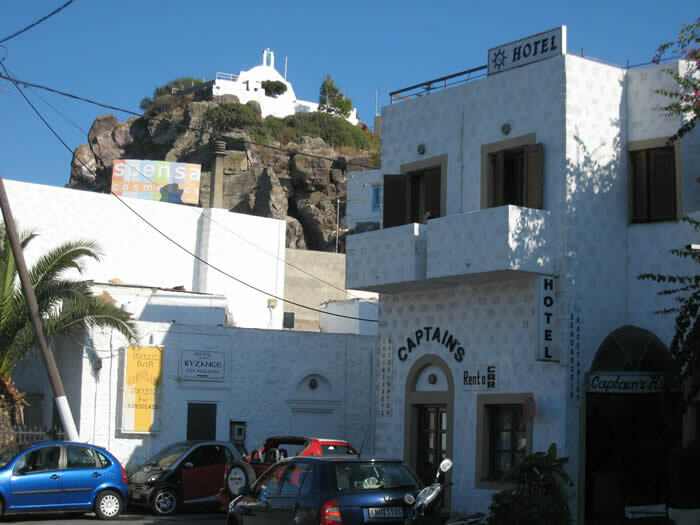 Its coastline, especially on the east side protected from the wind, offers a string of beaches, most graced with a taverna or two. To explore it properly you can hire a car, but a scooter’s more than adequate. 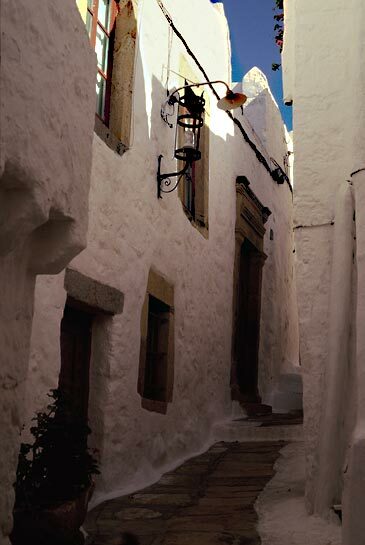 Of course you must not miss the working monastery, surrounded by a picturesque chora of narrow streets and white cottages, dominating the landscape. The interior is fascinating and the views from the walls are breath-taking - or would be if the local branch of the H&E Exec had not recently decided they are too dangerous. 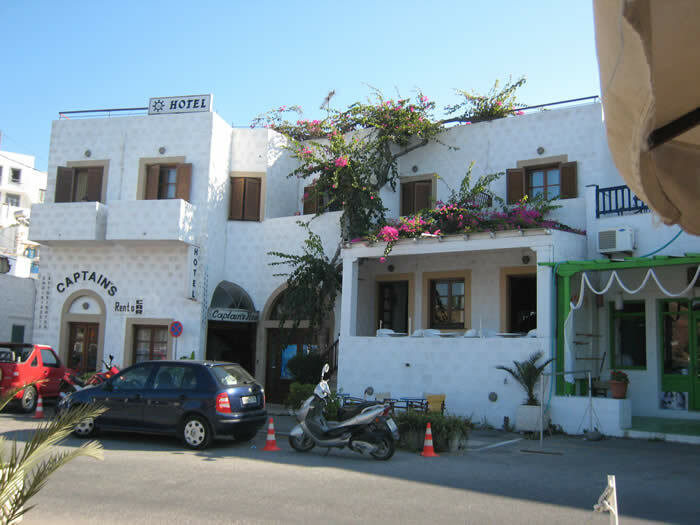 Skala, the main village, spreading back from the quayside is becoming surprisingly attractive and it is there, rather than in the chora, that you will find most of the island’s restaurants. 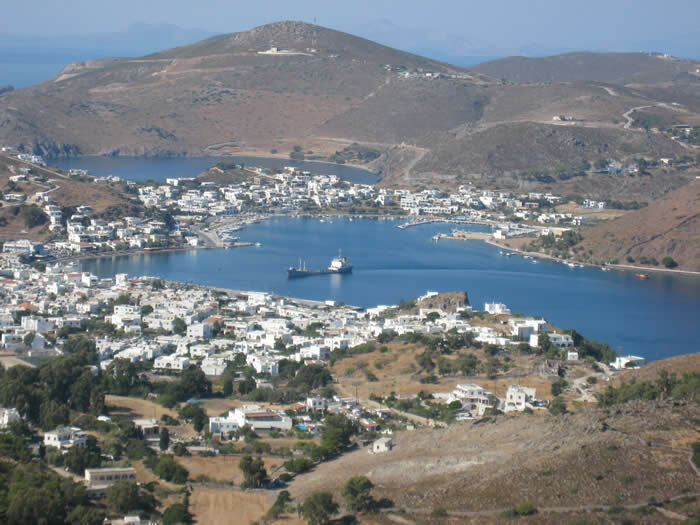 For a change and a sea-breeze you can take a boat trip to neighbouring Lipsi, Leros, Kalymnos and Fourni. Captain's House Hotel, with its guardian church above. View from Hotel Porto Scoutari out to sea. 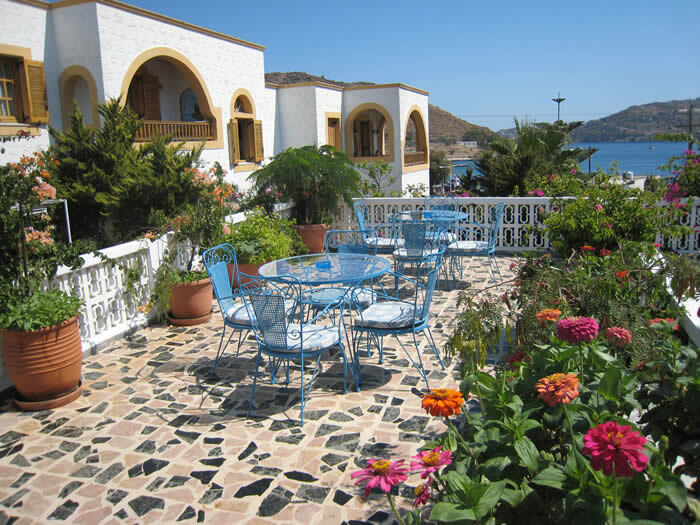 The smartest hotel on Patmos, set round a large swimming pool, with lovely views and 15 minutes on foot from Skala. 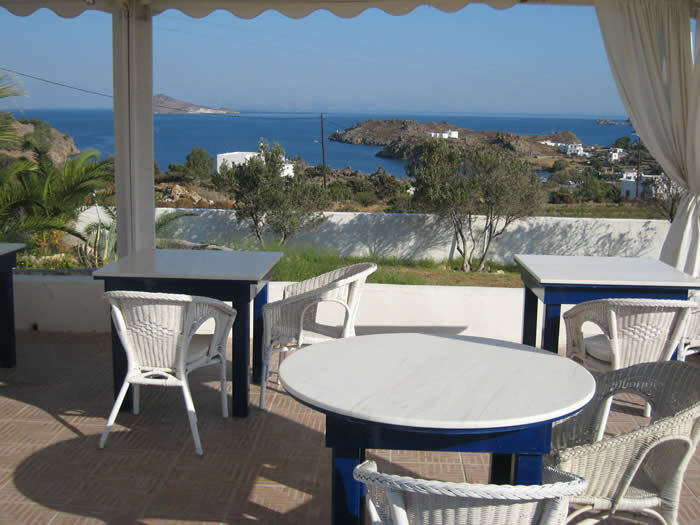 The rooms, furnished with island antiques, have balcony or veranda, most with sea view. Cat.B; pool, sauna, internet/fax; air-con, sat TV, king size beds, mini-bar, hair-drier, coffee machine, safe-box; B&(buffet)B. 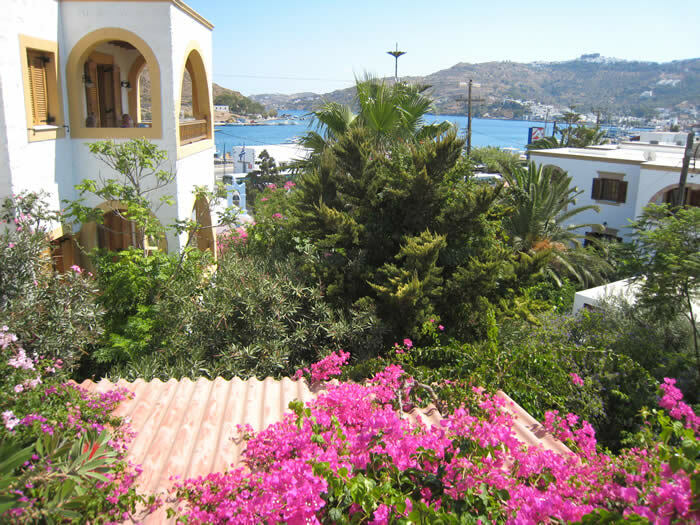 A small complex of studios and apartments submerged under swathes of exotic shrubs with views across the harbour to the monastery. 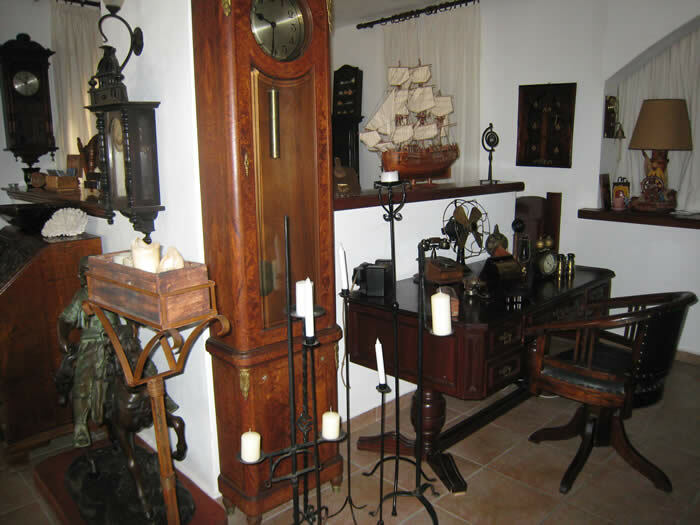 Relaxed atmosphere, friendly helpful staff speaking English. 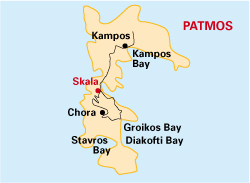 About a 15-minute stroll into Skala along the coast. Right on the harbour with nice views (unless a cruise-ship parks in front). Excellent rooms and a pool in the back yard make this a convenient choice. Breakfast inside or on the quay! Air-con; pool. Supp.for sea view. B&B.